How much do you spend every month on energy? The average American household spends between $74 and $203 per month on energy, with the total amount varying significantly from one state to another. Hawaii was the most expensive state in the nation for energy, with an average bill of $203.15 per month. New Mexico is the USA’s cheapest state for energy, with average household bills of just $74.62 per month. Whether you live in one of the country’s most expensive states for energy or one of its most affordable locations, it’s extremely likely that your household is spending more for energy than it needs to. Households overspend on energy for several reasons. One is habits – many people, even those of us who are aware of the importance of energy efficiency – forget to switch off lights or use the air conditioner more than we need to. Another is comfort and convenience. Although it’s possible to reduce your energy usage consumption by using fewer appliances, the majority of people are happy to trade a slightly higher bill for a more convenient, comfortable lifestyle. A final factor is energy efficiency. Many of the appliances in most homes, from TVs and consumer electronics to essentials such as air conditioners and water heaters, are far less energy efficient than new models that use more modern technology. By replacing your home’s water heater, you could significantly reduce your home’s total energy consumption, leading to a lower monthly energy bill and large savings over the course of one, two, three or ten years. How much can you save by using an energy efficient water heater? As of April 2015, all residential water heaters sold in the United States are required to comply with the new Department of Energy regulations for energy efficiency. This means that today’s water heaters are far more efficient than yesteryear’s models. On average, small water heaters that use more efficient technology use about four to five percent less energy than the next best models. This may not sound like much, but it’s important to consider how much energy your water heater uses. On average, most homes spend 20 percent or more of their energy bill on water heating – a significant amount of a major monthly expense. This means that by reducing your water heater’s energy consumption by four to five percent, you can reduce your monthly energy bill by one to three percent. This leads to a monthly saving of around $6 in the country’s most expensive states for energy. Not amazed by the four to five percent improvement in energy efficiency? The four to five percent figure compares small water heaters to the next best water heaters that don’t use modern technology. If your home has a water heater that’s five or ten years old – or, in some cases, even older – it’s extremely unlikely that it performs as well as even today’s least efficient water heaters. This means that your monthly savings could be even greater. It’s also important to consider that large water heaters – heaters that hold upwards of 55 gallons – are required to use even more advanced technology, resulting in far greater energy efficiency improves than smaller residential water heaters. If your home uses a large water heater, your potential savings from upgrading to a modern heater that complies with the new Department of Energy regulations could be far higher, resulting in significantly lower monthly energy bills. 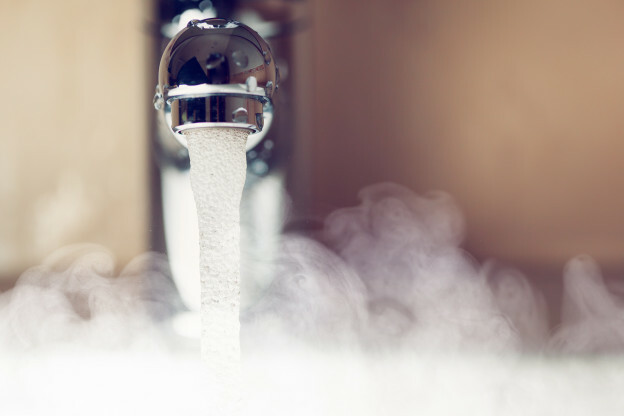 Should you upgrade to a newer, more efficient water heater? If you’ve started to notice a decline in the performance of your water heater – less hot water or an increase in the amount of time it takes to heat water for your home – upgrading to a newer model is an excellent idea. Switching to a new Orange County water heater not only gives you faster access to hot water – it’s also a great way to reduce your monthly energy bill and live a greener, much more environmentally responsible life. With the new Department of Energy regulations in effect, all water heaters sold in the United States are required to be more energy efficient than before. Make these new regulations work to your advantage by upgrading your water heater today. This entry was posted in Blog on April 25, 2015 by Scott Harrison.